Public Works Services presented a report to Council on the quality of the Drinking Water System for 2017. The findings from the 2017 report demonstrate that the Town of Newmarket meets all regulatory compliance requirements that are outlined in the Safe Water Drinking Act, 2002, and that the Town continues to provide safe drinking water to Newmarket residents. The Ministry of Environment and Climate Change conducted a Drinking Water System Inspection of Newmarket’s Drinking Water System and the inspection resulted in a 100 percent rating. The Town of Newmarket continues to work closely with the Ministry of Environment and Climate Change, the Region of York, consultants and other local area municipalities to develop short and long-term strategies to optimize system operations. To view the full report, please visit newmarket.ca/waterwastewater and click on ‘Annual Water Quality Reports’. Newmarket Council along with Beth Hart, curator from the Elman W. Campbell Museum recognized the winners of the 2018 Civic Art Contest award recipients. The Civic Art Contest included artwork submitted by local high school students. The contest helps to develop creativity, improve communication, create a better understanding of culture and helps students to make connections. The artwork is on display until April 27 at the Municipal Offices (395 Mulock Drive) during regular business hours. Newmarket Council has directed staff to work with the Developers to ensure the restoration and preservation of the Bogart House. A site visit to the Bogart House is being arranged with representatives from the Developer and Town, including the Newmarket Heritage Committee, to examine avenues to protect the Bogart House and options for restoration. The Bogart House is a designated heritage house and is one of the most important heritage buildings in the community. As such, Newmarket Council seeks full restoration and protection of this heritage house. The Town of Newmarket will host a meet and greet to celebrate Newmarket figure skater Gabrielle Daleman, who recently competed and won gold in the Team Figure Skating competition in the 2018 Winter Olympics in Pyeongchang. Gabby will be wearing her Olympic gear and will bring her gold medal. There will be a photo opportunity and she will be signing autographs. We invite everyone to bring their skates and enjoy a free public skate on the Hyundai Rink. 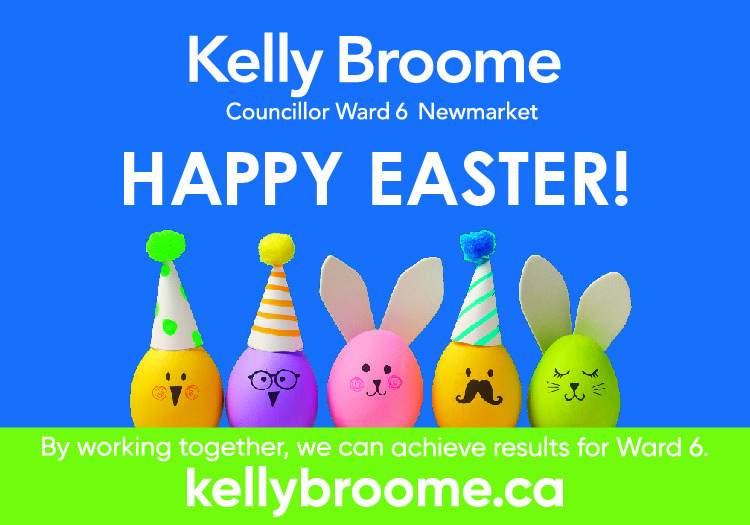 Location and time: Newmarket Magna Centre (800 Mulock Drive) from 5:30 to 6:30 p.m.
Drop in to the Elman W. Campbell Museum for an eggciting afternoon! Meet the Easter Bunny, enjoy Easter displays and fun activities like egg decorating. Light refreshments will be served. Don't forget to bring your camera! This event is suitable for children aged four to 10. Pre-registration required, cost is $5 per participant. Location and time: Elman W. Campbell Museum (134 Main Street South) from 1:30 to 3 p.m. Location and time: Newmarket Municipal Offices (395 Mulock Drive) on Thursday, April 5 from 6:30 to 8:30 p.m. There will be a presentation at 7 p.m.
Join us for an interactive discussion and lecture on the Ghost Canal (officially known as the Newmarket Canal). Decide for yourself if this was a viable plan, or if it was Sir William Mulock's 'madness'. Cost is $5 per person, and a portion of the proceeds go to the Newmarket Historical Society. Location and time: Old Town Hall (460 Botsford Street) in the Snapd Auditorium on Thursday, April 5 from 7 to 8 p.m. This exhibit is a glimpse into the distinguished life and artistic practice of the renowned Italian-Canadian painter Albert Chiarandini. Admission is free. Volunteers play a very important role in our community. Join us as we recognize our volunteers for all of their outstanding contributions to making Newmarket even better. This event is open to all volunteers in Newmarket, pre-registration is required and seating is limited. Please email Deanna Smith at dsmith@newmarket.ca or call 905-895-5193 ext. 2607 to register. Call for entries for the Town of Newmarket's 2018 Heritage Art Contest! Entries must be original two-dimensional artwork created in any medium and must focus on the heritage of Newmarket. This may include, but is not limited to, the Municipality’s culture, society, economy, history, significant events, architecture or natural environment in Newmarket’s past or present. The contest is open to all residents of Ontario. Location and time: Submit artwork from April 16 to April 30 to the Newmarket Recreation and Culture Department at the Municipal Offices (395 Mulock Drive). Artwork will be on display the first week of May to July 31, 2018, at the Municipal Offices. Check out the incredible artwork created by our local high school students. The arts curriculum is based on developing creativity, communicating, understanding culture and making connections. The Elman W. Campbell Museum and the Town of Newmarket are proud to be community partners. Location and time: On display until April 27 at the Municipal Offices (395 Mulock Drive) during hours of operation. Are you ready for Spring? Look for your Town of Newmarket Spring and Summer Activity Guide online at play.newmarket.ca. Registration is now open. In honour of Canadian Mental Health Week and National Youth Week, the Mindful Project will be showcasing its second annual art exhibit and will explore the expressive and cathartic process of creating and sharing art. The Old Town Hall Gallery is calling all artists to submit their pieces related to mental health and wellness. Themes include situational or personal trauma, forms of mediation, meditation and relaxation. Submissions are being accepted until March 29 at 4:30 p.m. The exhibit will run from May 1 until June 28. Newmarket Council approved a Borrowing By-law that would allow the Town of Newmarket to obtain a $26 million loan from Infrastructure Ontario with repayment terms of 30 years to finance the additional expenditure of the 2018 Supplementary Budget. This will account for a 2.6 per cent increase on the tax base, which works out to $47 per year for 30 years for the average assessed home in Newmarket. The additional expenditure will be used to finance the purchase of the Mulock Farm/Estate located at the northwest corner of Yonge Street and Mulock Drive. For more information, including financial reports and schedules, please click here. After a long winter, spring has officially sprung and with warmer weather around the corner, Newmarket residents can get outside and enjoy all that Newmarket has to offer including the Soofa solar powered benches. The Town of Newmarket is proud to lead the way in innovative technologies by expanding its Soofa Bench program with eight additional units throughout the downtown area. This is a big step forward towards Newmarket being recognized as a smart city by using data-driven technology to improve quality of life. The Soofa Bench is an innovative bench that charges mobile devices using solar power, while creating a social space for neighbours to gather. The Town unveiled its first Soofa bench in Riverwalk Commons in 2016 and is now expanding its network for smarter place making. The expanded Soofa program enables Newmarket to join the Soofa Beta Cities network along with a number of major cities in the US, including New York, Boston, Austin, Los Angeles and more. Newmarket is the first municipality in Canada to be a part of the network. Through the network, the Town of Newmarket will work with Soofa as an early adopter of leading-edge technology and will advise on new product development to solve problems facing cities and towns, big and small. For more information, check out our media release. Want to be a candidate in Newmarket's Election? Those interested in becoming a candidate in Newmarket’s Municipal Election can file a Nomination form in-person with the Town Clerk as of Tuesday, May 1, 2018. Eligible candidates should first schedule an appointment by emailing elections@newmarket.ca to file their nomination. The last day for individuals to file their Nomination form is 2 p.m. on Friday, July 27, 2018. Further information and forms, including the required Nomination form will be made available by the Ministry of Municipal Affairs closer to the opening of the nomination period. Floods can happen everywhere, making them one of the country’s most common natural disasters. Flooding poses a greater threat in low-lying areas, near water, downstream from dams. Even the smallest streams, creek beds or drains can overflow and create flooding. During periods of heavy rain or extended periods of steady rains, be aware of the possibility of a flood. Please visit cyfs.ca for more information.